Puppet was Ch. Northwind’s Running Bear, BIS, BISS’s litter sister. We kept her to appease Heather because she wanted to keep Bear but he was already sold. Janal was going to be our kennel name to mix the names Jane and Alan. Puppet was the only dog of ours with that prefix! Jane’s mother’s name was Mary Annette and she had recently passed away, so she was named in honor of Jane’s mother. Puppet was shown only once because the family was busy with Heather’s gymnastics career and her meets were always the same weekends as the dog shows. 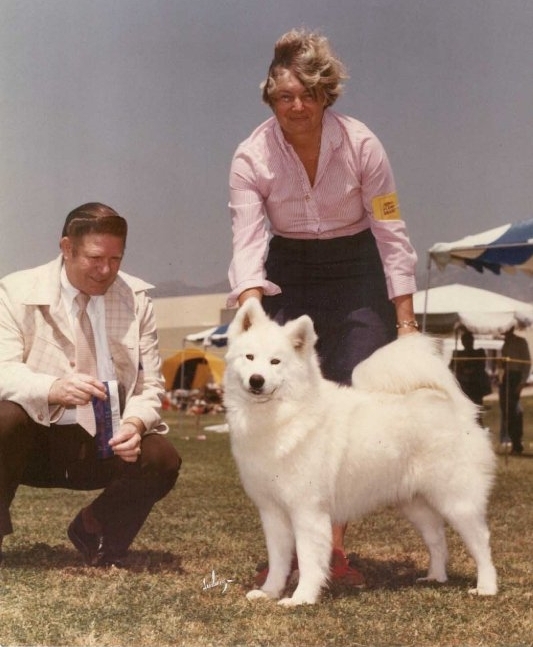 She went Best of Winners at the Simi Valley Kennel Club in May, 1978. After that, Puppet was essentially a house dog, and was best friends with our Doberman. She was the last of our Sammies until we got back into the breed with Drifter in 1988.